That’s what the USO promised for its World’s Biggest USO Tour on September 12, and that’s what the USO delivered. The USO brought hit country duo Florida Georgia Line, actor-comedian Adam Devine and celebrity chef Robert Irvine straight to the doorsteps of thousands of service members and patriotic Americans. The one-of-a-kind concert event, which took place in Washington, D.C., was livestreamed to thousands of viewers at watch parties across the world. Kicking off the evening from The Anthem, a state-of-the-art music venue in Washington, host Adam Devine welcomed the crowd of about 800 service members, their families and USO supporters with comedic reflections about his experience on the 2017 USO Holiday Tour. 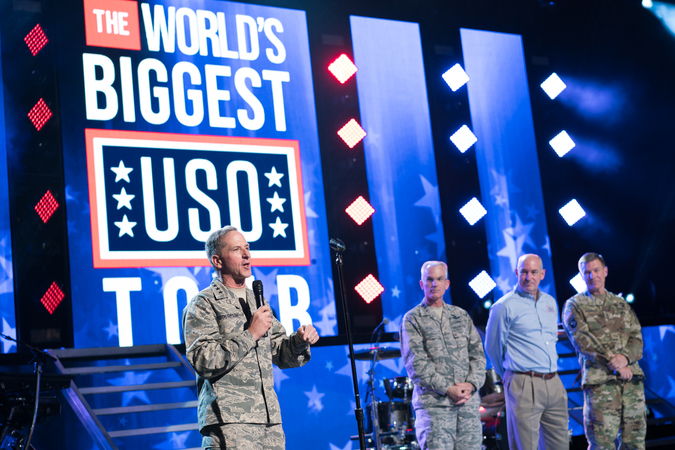 As a USO tour veteran, Devine explained the purpose of the World’s Biggest USO Tour. USO CEO and President J.D. Crouch II and Vice Chairman of the Joint Chiefs of Staff, Air Force Gen. Paul Selva, also welcomed the crowd and U.S. military leaders in attendance, which included Army Secretary Mark Esper; Chief of the National Guard Bureau, Air Force Gen. Joseph L. Lengyel; Vice Chief of Staff of the Army, Gen. James McConville; Navy Vice Adm. Matthew Kohler, director of naval intelligence; Army Lt. Gen. Daniel Hokanson, vice chief of staff of the National Guard Bureau; and Maj. Gen. Vincent A. Coglianese, commander of the Marine Corps Installations Command and assistant deputy commandant of Installations and Logistics. Comedian and USO tour veteran Adam Devine hosts the World’s Biggest USO Tour, a live entertainment experience at The Anthem in Washington, D.C., Sept. 12, 2018, bringing the USO mission to life and paying tribute to service members around the world. Chef Robert Irvine addresses a service member at the World’s Biggest USO Tour in Washington, D.C., Sept. 13, 2018. Performances from Florida Georgia Line, actor-comedian Adam Devine and Celebrity Chef Robert Irvine were live-streamed to service members in at 88 USO locations across the United States and around the world. Air Force Gen. Paul J. Selva, vice chairman of the Joint Chiefs of Staff, addresses sailors at the USO in Yokosuka, Japan via streaming video during the World’s Biggest USO Tour in Washington, D.C., Sept. 13, 2018. Performances from Florida Georgia Line, actor-comedian Adam Devine and Celebrity Chef Robert Irvine were live-streamed to service members in at 88 USO locations across the United States and around the world. Military families enjoyed a free performance by Florida Georgia Line and Adam Devine during the World’s Biggest USO Tour, a live entertainment experience at The Anthem in Washington, D.C., Sept. 12, 2018, bringing the USO mission to life and paying tribute to service members around the world. 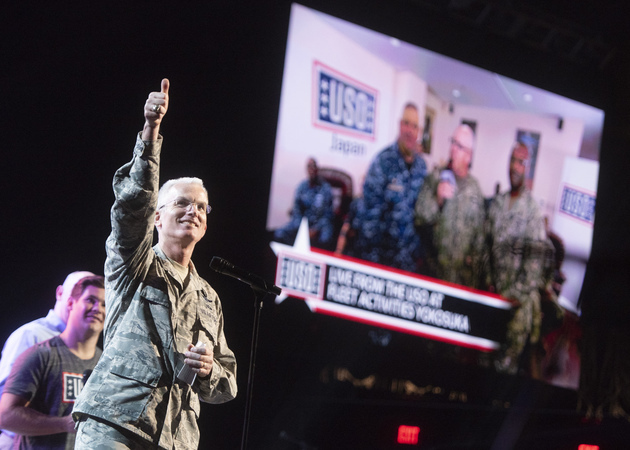 General David Goldfein, Chief of Staff of the Air Force, engages with the audience at the World’s Biggest USO Tour, a live entertainment experience at The Anthem in Washington, D.C., Sept. 12, 2018, bringing the USO mission to life and paying tribute to service members around the world. Service members enjoy the music of Florida Georgia Line at the World’s Biggest USO Tour, a live entertainment experience at The Anthem in Washington, D.C., Sept. 12, 2018, bringing the USO mission to life and paying tribute to service members around the world. Vice Chairman of the Joint Chiefs of Staff General Paul Selva teleconferences with a sailor stationed in Japan during the World’s Biggest USO Tour, a live entertainment experience at The Anthem in Washington, D.C., Sept. 12, 2018, bringing the USO mission to life and paying tribute to service members around the world. 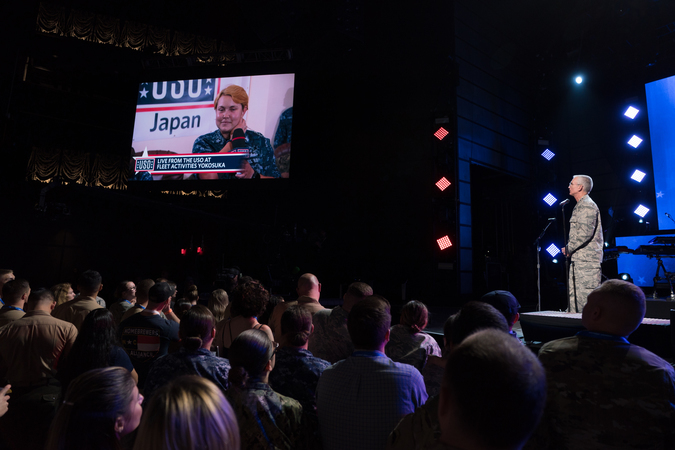 USO photo by General David Goldfein, Chief of Staff of the Air Force, introduces the talent at the World’s Biggest USO Tour, a live entertainment experience at The Anthem in Washington, D.C., Sept. 12, 2018, bringing the USO mission to life and paying tribute to service members around the world. J.D. 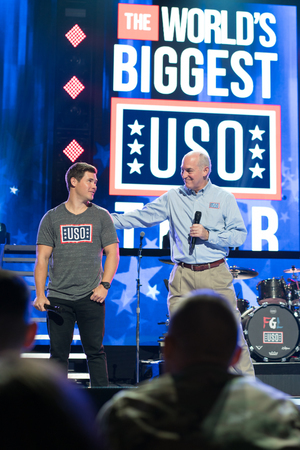 Crouch, CEO and President of the USO, shares the stage with comedian and USO tour veteran Adam Devine at the start of the World’s Biggest USO Tour, a live entertainment experience at The Anthem in Washington, D.C., Sept. 12, 2018, bringing the USO mission to life and paying tribute to service members around the world. Florida Georgia Line performs for service members attending in person and around the globe through streaming video at the World’s Biggest USO Tour in Washington, D.C., Sept. 13, 2018. Performances from Florida Georgia Line, actor-comedian Adam Devine and Celebrity Chef Robert Irvine were live-streamed to service members in at 88 USO locations across the United States and around the world. Designed to transport guests into a real-life USO center in the field, the USO2GO 360 tent display at the World’s Biggest USO Tour demonstrates the taste of home USO delivers to even the most remote areas in the world. The interactive display is part of a live entertainment experience at The Anthem in Washington, D.C., Sept. 12, 2018, bringing the USO mission to life and paying tribute to service members around the world. On stage, Selva explained how his parents met while his mother was serving donuts at a USO in 1949. He also recalled the USO Care Packages he received while serving in Saudi Arabia years ago. Selva then took the event live to USO Yokosuka in Japan, one of three USO live spotlight locations for the World’s Biggest USO Tour. Service members who attended the watch party at the USO Yokosuka center greeted the audience in Washington via two-way video. Vice Chief of Staff of the Army, Gen. James McConville, then connected the USO to another spotlight location and watch party – USO Camp Arifjan in Kuwait – followed by Air Force Chief of Staff Gen. David Goldfein, who connected with USO Alaska at Joint Base Elmendorf-Richardson. See stars in action on USO entertainment tours around the world. 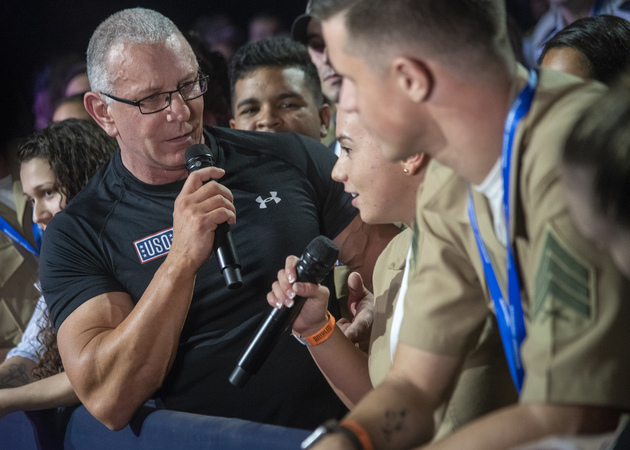 Celebrity Chef Robert Irvine, a veteran of the British Royal Navy and a longtime supporter of the USO, also made an appearance as he entertained service members in the crowd. With 14 USO tours to his credit, Irvine is especially dedicated to supporting service members and giving back to the military community. Retired Army Gen. George W. Casey Jr., chairman of the USO Board of Governors, welcomed the crowd of service members and their families before the concert and explained the significance of the night’s show. 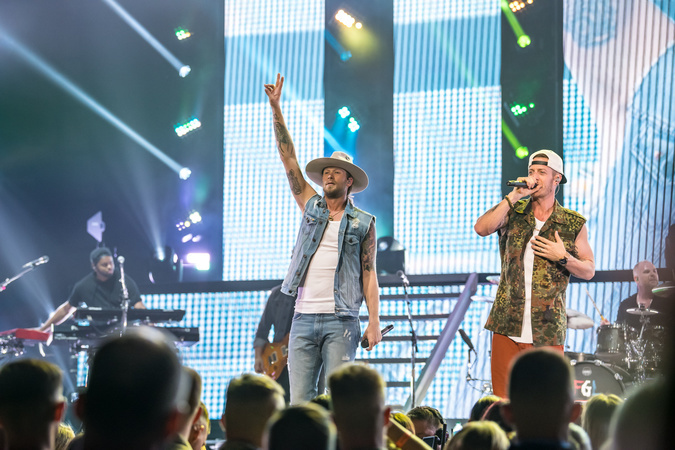 For Florida Georgia Line’s Tyler Hubbard and Brian Kelley, the show was a personal one. Kelley comes from a family of service members, including his grandfather, who was a POW in World War II and a two-time recipient of the Purple Heart. Florida Georgia Line gave an explosive performance of their hits for the crowd – literally. 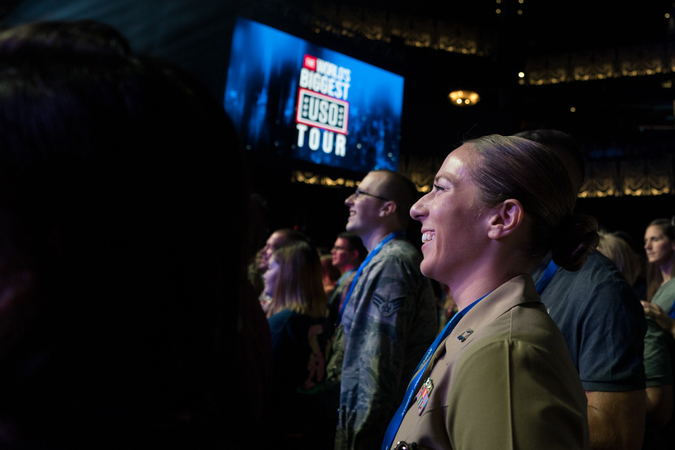 The World’s Biggest USO Tour was the first show at The Anthem to feature pyrotechnics, and service members in the crowd as well as those streaming across the world were part of an incredible concert performance that honored their service. Throughout the event, guests could explore experiential displays that allowed them to learn about the USO’s key programs and mission. Guests visited a replica USO tent built within the concert venue to give guests a feel for what a USO center looks like for deployed service members. Guests could explore even further by virtually walking through two USO centers in San Antonio. An interactive reading display at the World’s Biggest USO Tour highlights the Bob Hope Legacy Reading Program, which strengthens families by keeping them connected during deployment or other times of separation. The World’s Biggest USO Tour is a live entertainment experience at The Anthem in Washington, D.C., Sept. 12, 2018, bringing the USO mission to life and paying tribute to service members around the world. Other experiential activations showcased the USO Care Package Program, where guests could make their own customized care package for a service member overseas, and the USO’s Campaign to Connect, where attendees could write personalized messages of support to service members stationed around the world. Guests also visited a USO PathfinderSM lounge, where they learned about how the USO supports service members and spouses who are transitioning out of the military. An interactive library featured the USO Bob Hope Legacy Reading Program, which service members can use to record themselves reading stories and then send the videos home to their families. The USO has been bringing entertainment to service men and women since World War II. This year’s inaugural World’s Biggest USO Tour joins a longstanding tradition of strengthening service members and their families by keeping them connected to the people, places and things they love.